Linux is an operating system kernel used by a group of Unix-like operating systems. These are known as Linux operating systems. The Linux kernel is released with the GNU General Public License version 2 (GPLv2) and developed by programmers worldwide. After the post, many people contributed code to the project. By September 1991, Linux version 0.01 was released. It had 10,239 lines of code. In October 1991, Linux version 0.02 was released. A newsgroup alt.os.linux was started, and on January 19, 1992, the first post to alt.os.linux was made. On March 31, 1992, alt.os.linux became comp.os.linux. The X Window System was soon moved to Linux. In March 1992, Linux version 0.95 was the first to be capable of running X. This large version number jump (from 0.1x to 0.9x) was because of a feeling that a version 1.0 with no major missing parts would be released soon. On March 14, 1994, Linux 1.0.0 was released, with 176,250 lines of code. In March 1995, Linux 1.2.0 was released (310,950 lines of code). Linus decided, on May 9, 1996, to adopt Tux the penguin as mascot for Linux. January 25, 1999 - Linux 2.2.0 was released (1,800,847 lines of code). December 18, 1999 - IBM mainframe patches for 2.2.13 were published, allowing Linux to be used on enterprise-class machines. January 4, 2001 - Linux 2.4.0 was released (3,377,902 lines of code). December 17, 2003 - Linux 2.6.0 was released (5,929,913 lines of code). April 16, 2008 - Linux 2.6.25 was released (9,232,484 lines of code). Currently a new kernel version is released in every 2 3/4 months. In the start, Torvalds released Linux under a license which did not allow anyone to sell it. This was soon changed to the GNU General Public License (GPL), during version 0.12. This license allows distribution and sale of modified and unmodified versions of Linux but requires that all those copies be released under the same license and be accompanied by the complete corresponding source code. Torvalds has said licensing Linux under the GPL as the "best thing I ever did." ↑ "What would you like to see most in minix?". comp.os.minix. (Web link). ↑ "Free minix-like kernel sources for 386-AT". comp.os.minix. (Web link). ↑ (January 19, 1992). "Troubles with Partitions". or comp.os.minix alt.os.linux or comp.os.minix. (Web link). Retrieved on 2008-08-18. ↑ (March 31, 1992). "It's here!". comp.os.linux. (Web link). Retrieved on 2008-08-18. ↑ Yamagata, Hiroo (1997). "The Pragmatist of Free Software". HotWired. Archived from the original on 2007-04-14. Retrieved 2008-08-18. Nikolai Bezroukov, Portraits of Open Source Pioneers. Ch 4: A benevolent dictator (Softpanorama e-book). "LinkSys and binary modules". LWN.net Weekly Edition. October 16, 2003. FreeBSD/Linux kernel source code cross-reference. Browsable Linux (and other operating system) kernel source cross-reference. LXR: The Linux Cross-Reference project. Browsable Linux kernel source. "For the love of Hacking". Archived from the original on 1999-01-17. 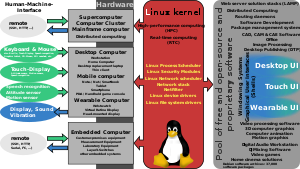 Wikimedia Commons has media related to Linux kernel. This page was last changed on 4 February 2019, at 14:22.